You can learn the personality of any car from the very moment you step on the gas pedal. How is the power delivered? Does the engine run rough or smooth? Is it comfortably drivable for the street or does it only feel at home on a race track? Many components contribute to the car’s driving personality, from ECU tunes to turbocharger upgrades, among countless other items in the engine bay. However, the valves act as the final gatekeepers for intake air and exhaust gases to enter and exit the cylinders. Ultimately, these valves and the camshafts that manage them establish the personality of the engine. With three sets of TOMEI Powered’s latest VR38DETT camshaft offerings on deck to test in the Club DSPORT machine shop, we’ll take a look at how this hardware potentially shapes the R35 GT-R’s driving behavior. Few engines can match the out-of-the-box performance figures of the VR38DETT. In showroom form, the 24-valve DOHC twin-turbo 3.8-liter V6 offers well over 500-hp at your right foot’s disposal. Install a few bolt-on upgrades, switch to E85 and hire a tuner for a day, and you’ll find yourself with over 600-hp to fire you down the quarter-mile in just over 10-seconds. Once pistons , rods and turbo upgrades are completed, the VR38DETT stands at the ready to produce more power. Maximizing power and efficiency requires improvements to the volumetric efficiency of the engine. When the valves open, how high they open and when they close are critical factors for the behavior and performance of the engine. Variable valve timing has many benefits and every major OE implements its own version of the technology. Nissan’s variant takes the form of a continuously variable valve timing control system (CVTCS). This configuration affects only the intake camshafts, retarding or advancing them as needed. The system manages to improve fuel efficiency, torque, and response. It’s a smart system, but the hardware overall still finds limitations in how much lift and duration that the factory cams can provide. In order to open up the valves and power potential of the VR38DETT, TOMEI Powered introduced three new camshaft sets. This includes the PONCAM 258-degree intake and 266-degree exhaust cams, the PROCAM 274-degree intake and exhaust cams, and the PROCAM 282-degree intake and exhaust cams. Each is designed to introduce distinct power and drivability characteristics, so we spun them on our Cam Pro Plus analyzer to reveal where the differences lie. For a base reference, we ran a set of factory VR38DETT camshafts on the analyzer. We measured max lift at 9.6mm on the intake side and 9.9mm on the exhaust side. Measured intake duration at 0.050-inch (1.27mm) and higher came in at 173-degrees, while exhaust duration at that minimum lift totaled 183-degrees. As for opening and closing rates, the intake cams showed a maximum opening rate of 0.01025mm/deg and a maximum closing rate of 0.01150mm/deg. The exhaust cams offer similar speeds, with a peak opening rate of 0.01075mm/deg and a peak closing rate of 0.01050. With the stock numbers recorded, we compared TOMEI’s offerings to see what improvements could be expected. 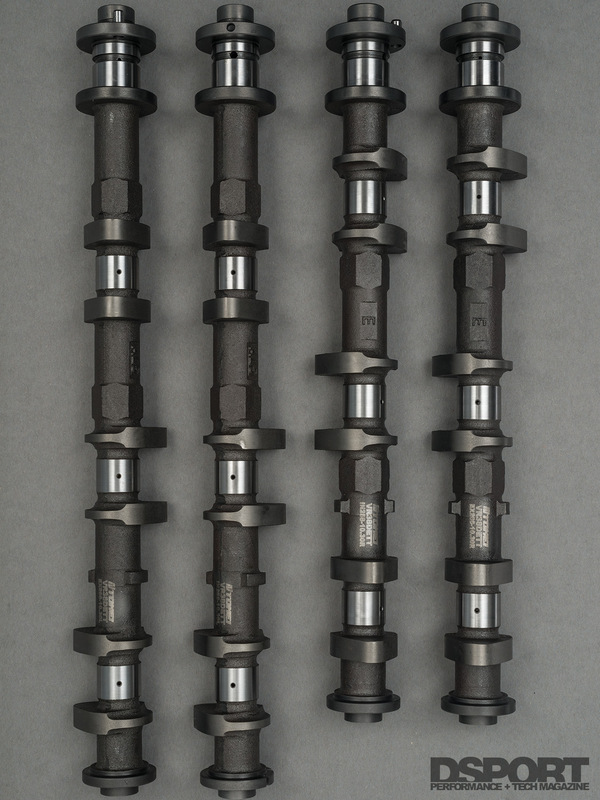 Our first test began with the PONCAM TA301A-NA01A camshaft set. This package includes a mixed pair of cams, a 258-degree intake cam (part number TA301C-NS01A) and a 266-degree exhaust cam (part number TA301E-NS01A). Starting with the intake bumpsticks, we found a 7.2-percent increase, or 0.75mm, to a peak lift of 10.3mm. Peak acceleration rates on closing and opening were similar to stock, increasing ramping speeds by only approximately 0.006mm/deg. At a base of 0.050”, the valve opening begins 8.6-degrees earlier and closing finishes 11-degrees later. This expands the duration @ 0.050” by 19.5-degrees for a total duration at 0.050” of 193-degrees with a profile area of 565 sq. mm; an increase of 21.2-percent. The 266-degree exhaust cam showed more differences compared to the OEM bumpstick. Peak lift increases from the OEM 9.9mm to 10.3mm for a difference of 0.4mm, or 4.0-percent. Unlike the intake side, the exhaust profile’s ramping speed increased dramatically with an opening rate of 0.01625mm/deg and a closing rate of 0.01275mm/deg. This can also be seen on the analysis curve, where the cam lobe area is significantly widened at and above 3mm to flush out exhaust gases. Duration at 0.050” also sees notable change, with valve opening occurring 7.3-degrees earlier, yet valve closing occurring approximately 4-degrees earlier. This brings duration up by 16.7-degrees for a total of 200-degrees. The duration change may be modest, but the aforementioned ramping rates make for significant changes to the total area, increasing it by 17.0-percent to a total of 600 sq. mm. The PONCAM TA301A-NA01A cam set is ideal for those seeking improved performance up to the factory redline. OEM springs can be used as the camshaft profile is designed to work within the limits of the factory springs. The higher lift on the intake side helps increase power and torque across the powerband, while the wider curve of the exhaust side provides extra help at midrange and top-end power. The extra overlap that occurs between the intake and exhaust valve openings allow for an enhanced scavenging effect for the exhaust gases leaving the cylinders to help pull in fresh intake air. At the same time, the adjusted opening and closing times of the valves help maintain a relatively smooth idle. 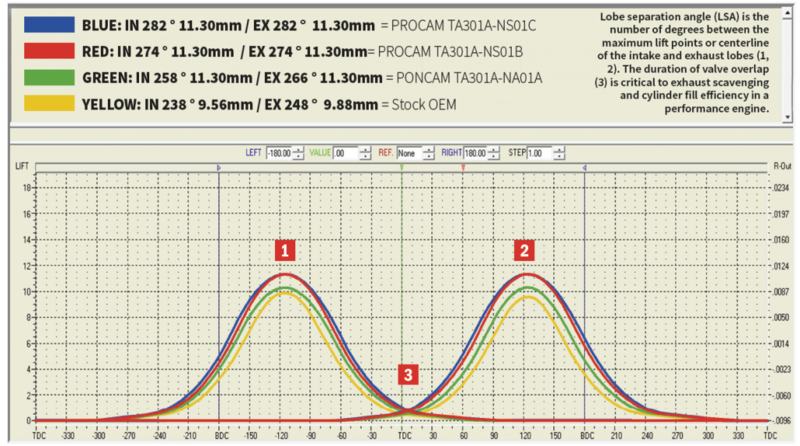 The PROCAM TA301A-NS01B camshaft was tested next. This set comprises a 274-degree intake cam (part number TA301C-NS01B) and 274-degree exhaust cam (part number TA301E-NS01B). On the cam analyzer, the intake cam lobes measured a peak lift of 11.3, 1.75mm or 15.0-percent higher. Ramp speeds for the intake increased significantly, with a peak acceleration rate of 0.01400mm/deg upon opening and 0.02100mm/deg upon closing. When basing lift off of a starting height of 0.050-inches, the TOMEI 274 intake cam opens 16.6-degrees earlier and closes 19-degrees later for a duration at 0.050” of 209-degrees. This increases the open area from 466 sq. mm to 671 sq. mm; a 44-percent gain. 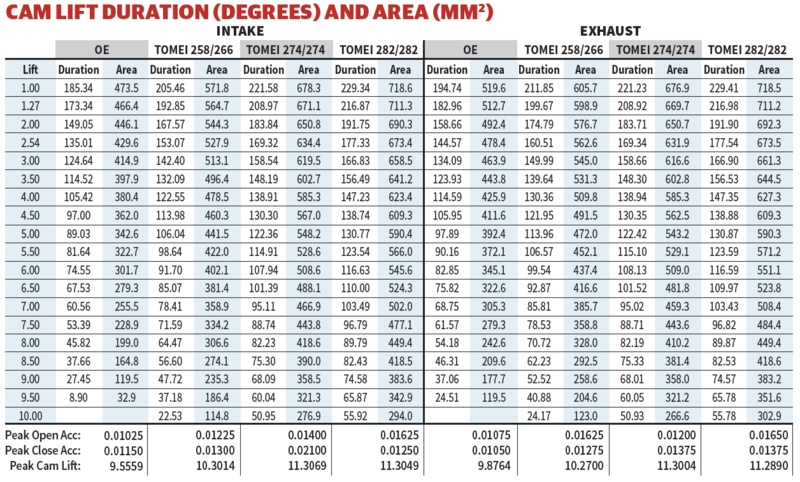 The exhaust side showed similar results, with lift maxing out at 11.3mm, an increase of 1.4mm or 12.6-percent. Ramp up speeds increased the stock 0.01075mm/deg opening rate to 0.01200mm/deg, while peak closing rate moves from 0.01050mm/deg to 0.01375mm/deg. The TOMEI exhaust cam opens 11.5-degrees earlier and closes 14.4-degrees later than the factory version to bring the duration to a total of 209-degrees. This makes for a total area of 669.7 and an increase of 30.6-percent. With more lift and duration than the PONCAMS, the 274-degree PROCAMS are more aggressive. The lobe profiles make for earlier valve-opening and later valve-closing, along with quicker ramp-up rates and a larger overall area to maximize airflow. The quicker opening and closing rates call for upgraded valve springs to control the valves and avoid valve float. TOMEI Powered upgraded valve springs (TA304A-NS01A) increase the intake valve seat pressure by a little over 20-percent while the exhaust seat pressure is increased just over 30-percent. Over the nose, these higher rate springs deliver 60-percent more pressure on the intake and 70-percent more pressure on the exhaust. While these cams can be used on an unported cylinder head, the cam profiles excel when combined with oversized valves and porting of the cylinder heads. 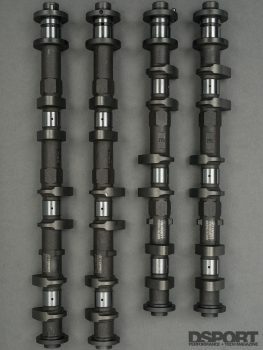 Despite needing a total of four unique camshafts, the retail pricing is $440 per pair (L&R) of intake or exhaust cams. The TOMEI PROCAM TA301A-NS01C is the biggest, employing a 282-degree intake cam (part number TA301C-NS01C) and a 282-degree exhaust cam (part number TA301E-NS01C). 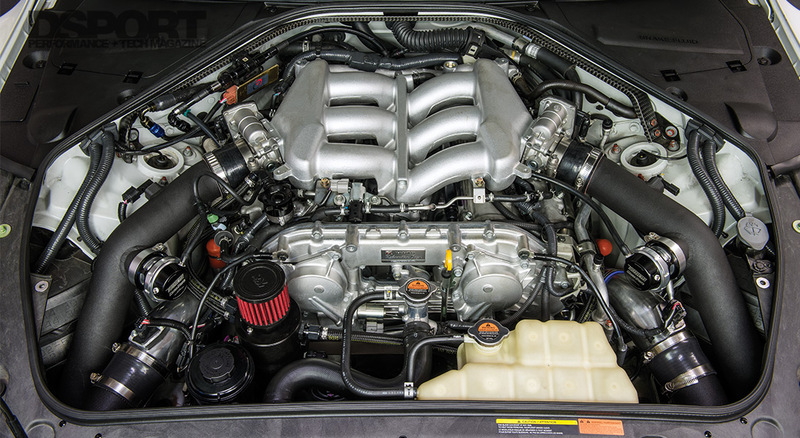 The intake cam increases lift to 11.3mm, a 1.7mm and 15.5-percent increase over the factory version. Peak opening acceleration takes a significant bump to 0.01625mm/deg, while the closing rate actually sees a milder change to 0.01250mm/deg; a similar rate to the PONCAM exhaust camshaft. Duration expands significantly at 0.050” lift and higher, as the intake valve-opening starts 20.5-degrees earlier than stock and closes 23.0-degrees later. The extra lift and total 217-degrees of duration combined make for an entire 711.3 sq. mm cam lobe area; a significant 52.5-percent increase. The exhaust cam follows suit as the lift increases to 11.3mm, 1.4mm higher than stock. Similar to the intake camshaft, the exhaust peak opening acceleration sees a greater increase than the closing rate. In this case, peak open acceleration reaches 0.01650mm/deg, while the peak closing acceleration is raised to 0.01375mm/deg. The exhaust side actually implements a smaller duration increase at 0.050” than the intake side, opening the total to 217-degrees. This still makes for a notable area increase of 38.6-percent to 711.2 sq. mm. 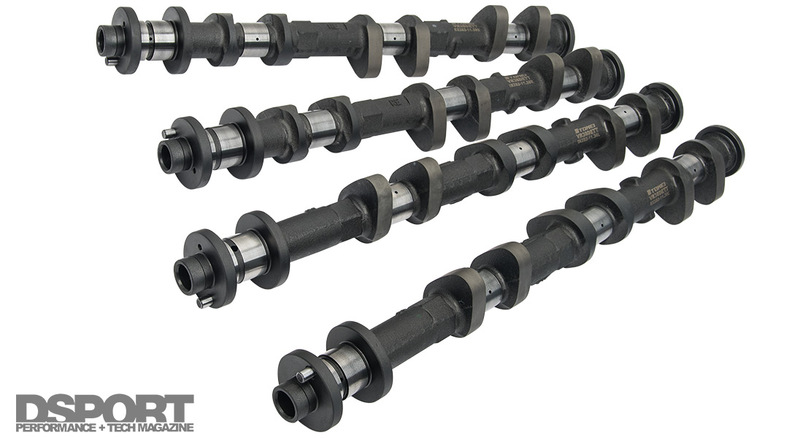 The Procam TA301A-NS01C camshafts carry over many of the same characteristics as the 274-degree set, but the additional duration allows for a gentler closing event. These cams are best suited for increased-displacement VR38s or big turbo setups. Increased duration and the increase in overlap will improve performance further at high RPM, while sacrificing idle and low engine speed performance. TOMEI Powered delivers three very distinct camshaft options for R35 GT-R owners to choose from. Each set increased VR38DETT’s output, with the more aggressive 274-and 282-degree cams trading off some low-speed performance for high-RPM fun. As the cams get more aggressive, the power figures steadily grow as the engine’s volumetric efficiency is improved at higher engine speeds. The PONCAM option optimizes performance up to the factory redline. The PROCAM options are good to 8,000RPM when teamed with TOMEI Powered’s valve spring kit or higher engine speeds if stiffer springs are used. 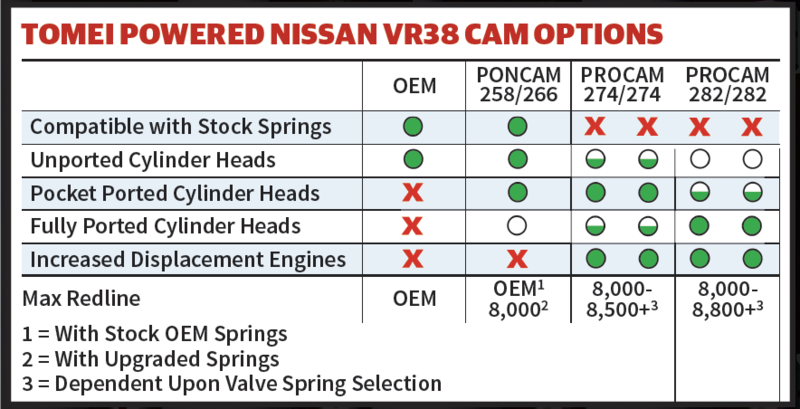 While “bigger” cams with longer duration will tend to sacrifice idle quality, stoker VR38 engines can generally go up a level in cam selection without the idle quality sacrifice. 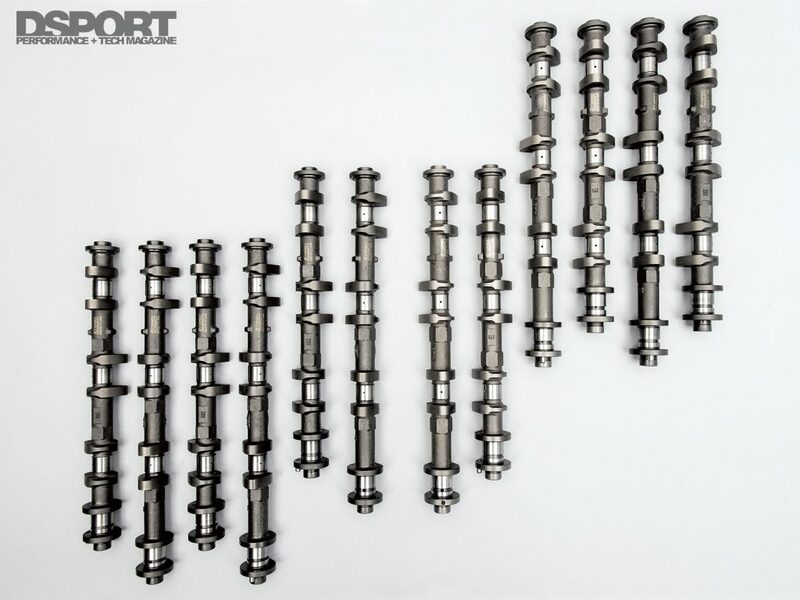 As with any performance combination, the camshafts are just one piece of the puzzle. Fitting the turbo combination to match will ensure peak performance. Next Article The Top 10 Car Modding Myths Busted!